D rank 「Golgo dungeon」 was having business as usual. There were adventurers recruiting for party members near the entrance. There were also merchants that were selling supplies for those who forgetten to buy it in town. There are some adventurers that were quarreling in front of the dungeon entrance. There were many parties like this that doesn’t have a similar goal and later broke up. At that time, a painful remark was delivered by a girl that moved past them. Of course female adventurers were small in numbers so the sight of the girl caused the adventurers nearby to look at her. It was a girl dressed in a maid uniform. On top of the maid uniform there were no armor could be seen and nothing conspicuous, can it be a maid adventurer? Comer city’s male adventurers for a while had been creating some new faction. Lalit was the leader of Nina faction which possessed the chest of supreme magnitude. Marifa faction was led by Siam and Lena loli faction was lead by Muga and kept saying loli was absolute justice. No mater what, they were one of the best looking female adventurers around. On the guild side, there was Collet faction that was full of youth energy, Edda onee-san faction with uncertain age, and also Barbara faction with dynamite body. There were many changes recently. If people can say, it must be a new era of war. Many male adventurer were willingly sacrificing themselves for these beauties. However it was a different story setting. Everyone else knew that usually she went with Yu and right now seeing her alone, they were anxious. However rather than worried, most also have ulterior motives in this kind of situation to get close and take advantage of her. Marifa with a short curt reply without even looking at them entered the dungeon. not long after, Joseph was chasing after Marifa. It was an uproar for someone like Joseph to roam in D rank dungeon. Marifa was saying that to Joseph that was watching quietly from behind. She even didn’t care and use harsh words on him. when Yu name was mentioned, Marifa couldn’t say anything else. Marifa’s arrow along with the splitting wind sound was struck through 「Salamander」 vital points. After that she pulled out the arrow from the Salamander and neatly gathered the materials. It’s been two hours and she has reached the 4F. 1 week after the fight with Goria, finally Marifa was able to get out from the bed. Coro on the other hand couldn’t get past his shock after knowing that Sukke passed away. After taking care of the mansion, Marifa was entering the dungeon alone every day. However it wasn’t an easy journey as she has encountered continuous struggle. In particular, when she was facing 「Golem」, her insect was useless and she had to tried her best defeating it using a combination of her bow attack and magic. By the time she reached the 9F, she was exhausted and her whole body maid uniform has been damp from sweat. Marifa with heavy breath return to the road where she came from. However a 「poison grizzly」 could be seen. Marifa prepared her bow and with first rank 【spirit magic】, 《fire arrow》 delivered an accurate shot to its heart and cause it to stop. Hearing Marifa words, Joseph could only opened his mouth saying anything. Joseph knew Marifa was the weakest out of them. Nina right now could only talk a little. Lena on the other hand was in much worst state and could only say one or two words or even stay in silence without answering. Joseph could clearly see how much the girls cares for Yu. Marifa on the other hand tried to hide it in. Joseph tried to talk to Marifa using some clue that he learned from Mussu. However the answer. Marifa i\was able to replied without showing much emotion or pain. Her reaction resulting in Joseph giving a bitter smile and had a change of attitude. However Marifa started to respond to his question. Since the discussion was now focused on Yu, she has been replying from time to time. Starting from the first time Yu come to the Comer city Adventurers guild, participating in a rookie quest that turned out to be 「goblin king」 subjugation. Marifa showed some reaction when Joseph told her the story. Joseph seemed to not know the real extent of Marifa injury. at that words, Marifa stopped moving and look at Joseph. After that Marifa showed a slight smile and returned to her usual expressionless expression. Only Joseph indignant cries could be heard echoing in the dungeon. HEY!!! Aren’t getting too close to Nepu-chanma day after day? What are you trying to do? 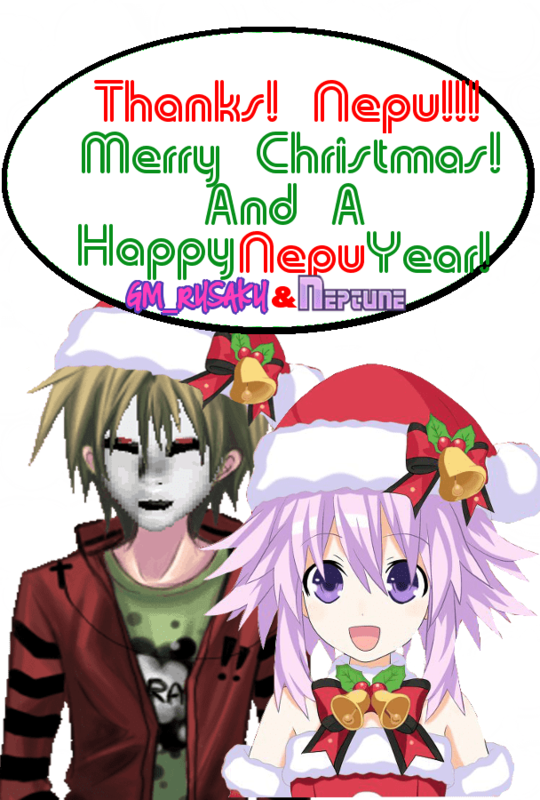 As Neptune-sama’s former slave, I should be close to her…. So she cant run away from work as Histoire-sama instructed me. Child do you want to talk about the words of our Goddess Neptune? And this is Noumu ! i think the story would skip a couple of years. joseph lead yu’s party to travel around the world to find him then on their way they heard some rumors about threat of new maou. turn out yu is already a maou. C’mon, Nina, Lena! Stop relying on Yu and try to become independent! Look at Mari-chan, she’s trying her best to become stronger, for the sake of her master loved one companions. ….though it’s only one week so I guess they’re still moping about it. I think there is more? hugging pillow and for sniffing? whatever. Well they did act alone when they shouldn’t though. I’m all for Nina and Lena being on a rampage in the Holy Kingdom’s capital. Go, massacre those bastards! what isnt there a hidden yuu faction from all of the girls in the city!? After that Marifa showed a slight smile and returned to her usual expressionless expression. a few typos 2 chap ago, but I was only on mobile sorry. They rely on Yu too much, that’s also a reason why I believe Yu leaving was a wise decision. These clingy immature girls need to stop clinging and moping and start acting independent so they can stand beside Yu as his companions. The last battle clearly showed they’re not ready to handle being with him since strong enemies are coming and they should start training.